I love the follow up emails that companies send after phone calls. Care to take a guess how my recent AT&T Internet Services Experience went? I think this screengrab of my email tells volumes. I wish I could have just sent them this. Things have to get pretty bad for me to let Comcast back in my house. Multiple folks trying to up-sell me on unrelated services while I am trying to resolve a support issue takes the cake. No I really don’t want to tell you why I like my satellite service, I’d really just like to know why I can’t get a decent download speed on my DSL. Ultimately I got in touch with someone in upper tier support who could partially help but the damage long done by that point. I am sorry for the experience. 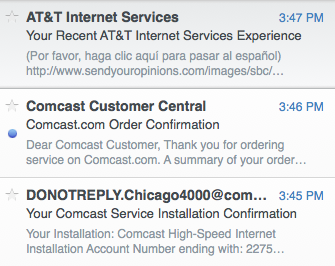 If you don’t mind, will you please share more details on your experience from Comcast? I work for Comcast and I’d like to share your experience with my colleagues.